2017: 1,002 breaches to date (09/13/2017) exposing 163.1M personal records, with 88% containing social security numbers (SSNs). And the year isn’t over yet! 2016: 1,093 breaches exposing 36.6M personal records, with 52% containing SSNs. 2015: 780 breaches exposing 177.9M personal records, with 43.7% containing SSNs. Globally over 700M personal records were breached that year. For individuals affected by the SSN hacks, this is infinitely more painful than a compromised credit card. They face a lifetime of monitoring their credit and will inevitably fall victim to a fraudulent attack at some point in the future. For commercial enterprises and government agencies, it means your IVR and contact center are going to be bombarded with fraudsters confirming existing accounts and activating new ones using the stolen social security numbers and other data. With a SSN, DOB and home address, fraudsters have the keys to unlock most accounts, change the address, have a new credit or debit card mailed out and steal your and your customers’ funds. Any additional data that may be required will be easily acquired using social media or phishing the customer. What Can Your Enterprise Do? Most enterprises are completely blind to fraudulent activity taking place in their IVR and totally unprepared to handle this type of breach. You could “lock the credit” and force excessive measures on all callers, but the result would be a bad customer experience (CX) for legitimate callers. Enterprises would lose customers, and government agencies would receive endless citizen complaints. The solution is with Behavior Analytics. With behavior analytics from the IVR, we can separate the fraudsters from the legitimate callers even if the bad guys have all of the data required to authenticate. We can detect the fraudulent activity well upstream of many existing processes and without sacrificing CX. Bad guys have data they need to authenticate. You must be able to detect they have the right data but it’s not the right person. Using a proprietary Adaptive Fraud Prevention solution leveraging behavior analytics and other data sources from your IVR, we can detect potential fraud. Behavior analytics detects and flags the questionable interaction. The fraudster is using the same data as a legitimate caller (since they stole their information with SSN), but their behaviors with that data will differ from the legitimate caller, and we detect it. This can work with any IVR to reveal fraudulent activity you may be currently unable to detect. Incorporating this multi-layered fraud detection tool in your IVR will help you better detect potential fraudulent activities, determine their authenticity, and identify and stop the bad guys. Want to Know More, and Fast? > Reach out to discuss your needs. 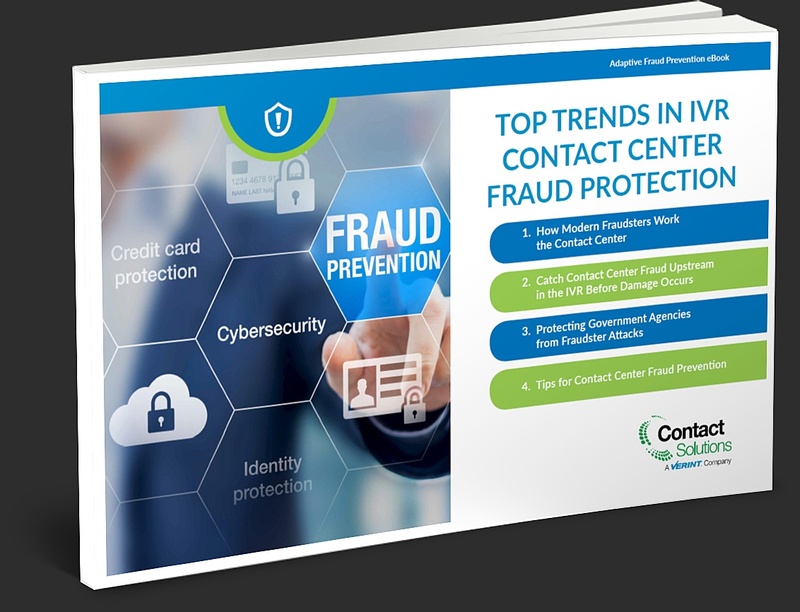 > Review the fraud IVR trends eBook below.